If you have managed to catch your breath following UFC 205, you’d be delighted to hear the UFC have TWO bumper regional shows for you to watch on Saturday. It would be understandable if you missed the memo, given two enthralling title fights in addition to Conor McGregor’s awe-inspiring display against Eddie Alvarez to become the promotion’s first ever champion to hold two belts in two different weight classes simultaneously on last Saturday’s inaugural New York City UFC show at the iconic Madison Square Garden. It’s usually difficult to pick a great fight flying under the radar for one event, so this has thrown a curveball given the quality on both UFC Fight Night: Mousasi vs. Hall 2 (UFC Fight Night 99) and UFC Fight Night: Bader vs. Nogueira 2 (UFC Fight Night 100)—to be held in the SSE Arena in the UFC’s long-awaited return to Belfast, Northern Ireland, and in Sao Paulo, Brazil’s, Ginasio do Ibirapuera, respectively. Both events showcase exciting rematches as its main event. Besides the headliner, Belfast’s show boasts some fantastic fights such as Kyoji Horiguchi vs. Ali Bagautinov in a flyweight thriller, an all-British clash between brawlers Ross Pearson and Stevie Ray, and a lightweight showdown pitting Kevin Lee against Magomed Mustafaev. Sao Paulo has exciting contests of its own, including Thomas Almeida vs. Albert Morales, Cezar Ferreira vs. Jack Hermansson, Warlley Alves vs. Kamaru Usman in addition to the headliner and Claudia Gadelha’s return to the Octagon against Cortney Casey—the first time the Brazilian has stepped into cage since her losing effort against Joanna Jedrzejczyk in their title fight. 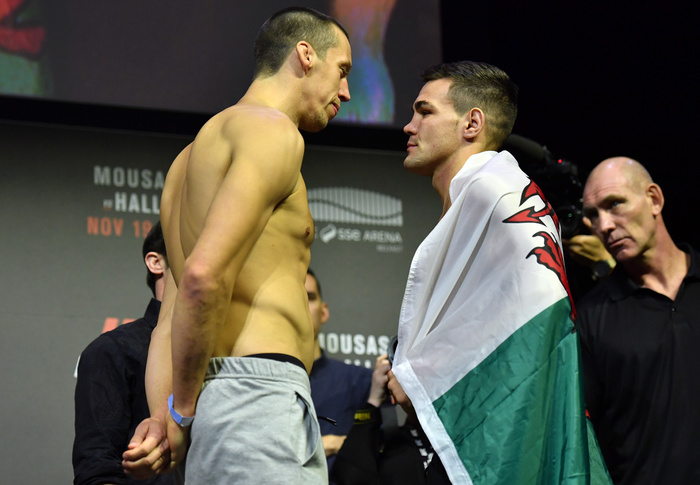 However, this week’s One to Watch is the eagerly-anticipated UFC debut of Jack “The Hammer” Marshman, the first ever Welshman to be signed to the UFC, who faces a tough test in his unveiling against the long, rangy, striking Swede Magnus Cedenblad in the UFC’s first show in Belfast for close to a decade. Earlier in October, it was announced the UFC had finally signed a Welsh fighter to its roster—a moment the country’s ardent combat sports fans had long been clamoring for and finally completing the collection of UFC fighters to hail from the British Isles. It was a moment savored by Welshmen and women and later celebrated further as Brett “The Pikey” Johns—another member of the Welsh contingent—was signed in addition. It was a long overdue move by the UFC, which followed Marshman’s knockout victory over Frenchman Christopher Jacquelin to win the Cage Warriors (CWFC) middleweight championship. Johns has similarly impressive pedigree, having won the CWFC bantamweight title and later his division’s strap in Titan FC. Aged just 26-years-old and a soldier serving as a Lance Corporal with the 3rd Battalion Parachute Regiment, Marshman has plenty of in-cage experience which belies his age—compiling an impressive record of 20-5 with contests against UFC and The Ultimate Fighter veterans such as Bola Omoyele, Scott Askham, Xavier Foupa-Pokam and Tom “Kong” Watson in the fledgling stages of his career. He’s exciting, too: winning 12 of his fights by knockout and five by submission. Entering the UFC as a Cage Warriors champion certainly has a good precedent. Both Michael Bisping and McGregor made the switch as light heavyweight and dual featherweight and lightweight champions respectively—McGregor repeated that feat on the biggest stage of all in the UFC last Sataurday, while Bisping earned the UFC middleweight title at UFC 199 in June in a shock knockout win over Luke Rockhold. Winning a title in any promotion is quite clearly a big deal for a fighter. But, for Marshman, it would appear his UFC call-up means much more to him after a decade of blood, sweat and tears put into his MMA career. “It’s been amazing. I’ve worked hard for 10 years to get where I am now and in my eyes this is just the beginning,” Marshman told WalesOnline. “To be the first Welshman signed by UFC obviously comes with a lot of pride. The reaction has just been unbelievable. I’m not the type of person to get overwhelmed but I didn’t realise how many people supported me until the day I was signed. I knew about it a week before the news broke, but when I woke up the morning it was announced - well, it just exploded. Welsh fans are indeed among the most vociferous support you’ll find in sport—buoyed by the country’s purple patch of sporting form with the Wales national football team reaching the semi-finals of Euro 2016, while any Welsh rugby success is always backed by a cacophony of Cymru noise. But, Welsh sports fans have also translated their vocal support in combat sports in the past, with the likes of Joe Calzaghe, Nathan Cleverly and Enzo Maccarinelli attracting big, loud crowds for their boxing contests. However, MMA has yet to enjoyed the noise produced by Welsh fans on the UFC stage. With the sport steadily building in Wales, Marshman is hoping to emulate McGregor’s success in helping inspire young Welsh athletes to compete in MMA, as well as eventually bringing a UFC event home. “McGregor opened the door for Irish MMA and now it’s one of the biggest sports in the country. He’s obviously a bigger character than me, but I think my fighting does the talking and I’m confident it will in the UFC. The man who will be staring at Marshman from across the Octagon is the tough, rangy Swede Magnus Cedenblad. 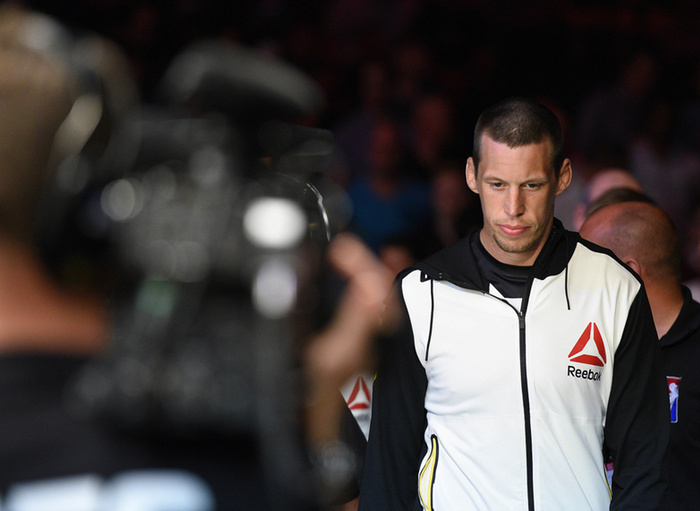 There are definitely easier introductions to the UFC than the challenge posed by Cedenblad—the 34-year-old all-rounder who has compiled a four-fight winning streak inside the UFC. Like Marshman, the middleweight native of Stockholm found success on the European circuit ahead of his call-up to the UFC, riding a seven-fight winning streak complete with six stoppages—enough to catch the eye of then-UFC matchmaker Joe Silva. Cedenblad lost his UFC debut, succumbing to a second-round submission in a tough matchup against Tristar Gym product Francis Carmont. But, as mentioned above, Cedenblad quickly got over that loss and has defeated Jared Hamman, Krzysztof Jotko, Scott Askham and Garreth McLellan on course to facing Marshman on Saturday. Given his recent run of form, it was expected that Cedenblad would face a ranked opponent in his next bout. Alas, he is fighting a newcomer in Belfast, but Cedenblad seems excited at the challenge Marshman will surely bring. “I commentated (on) Jack Marshman when he fought in Cage Warriors,” Cedenblad told MMAjunkie. “I think he’s a really good fighter, so I think it’s really interesting to watch,” Cedenblad told MMAjunkie. “I was like, ‘OK, whatever.’ I think it’s a good matchup. I’m looking forward to it. Of course I want the big fights. Despite the pleasantries, Cedenblad does indeed want a future match-up to push himself up the UFC rankings. Given how he has already defeated the 15th-ranked Jotko, who is fighting former UFC middleweight title challenger Thales Leites in Saturday’s Sao Paulo event, he appears irked at the fact he has been overlooked for top-level opponents and the rankings. With Cedenblad seeking to steal a march on his middleweight counterparts in the UFC rankings and Marshman making his long-awaited UFC debut, this fight is immensely important for both men. Two exciting fighters with plenty to fight for—make this fight your One to Watch this weekend.